OLD ... These are two of my pieces created with the technique of smocking. 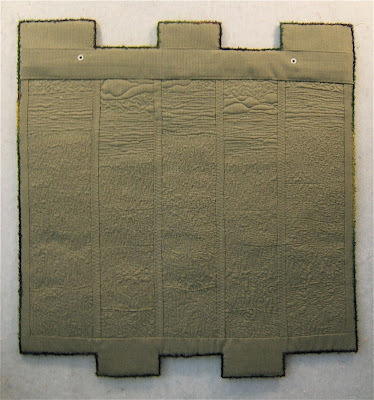 That method of stitchery is a surface embroidery across the surface of pre-pleated fabric. NEW ... My Christmas present from our older son is Adobe Photoshop. Wow! My head is getting a workout learning how to utilize that program. I foresee a lot of hard work ahead of me. So far, I've learned to straighten bowed frames caused by the distortion of my camera's lens, to eliminate backgrounds, and to add shadows. I would give more information about these pieces, but all of that is in Tennessee and I'm in Chicago. These pieces are so old that I've forgotten their titles even though they hang on our livingroom walls. I'll add captions to the above photos when I get home in January. I fly north today and won't have Internet access for a week. I'll be back after Christmas. In the meantime, here's a bit of holiday humor from our house. This is the area over our kitchen sink. Lee is holding a piece of fabric to cover the daylight from the window into the courtyard. 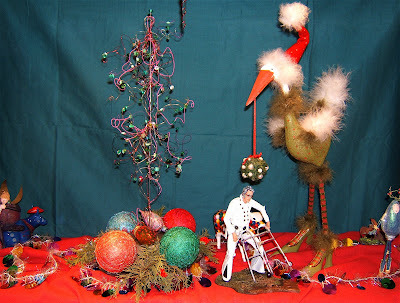 Geriatric Elvis standing under the mistletoe is his contribution. The beaded wire tree is made by my sister-in-law in Memphis. My friend, Alicia, painted the light bulbs and I thread wrapped styrofoam balls. The "sugar plum" fairy stirring a pot is my kitchen mascot. She lives in this spot and is a part of every arrangement. I wish all of you happy holidays! 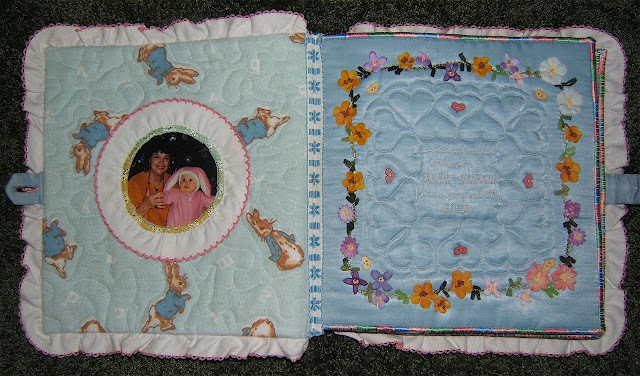 About twelve years ago I had made a silk cuddle quilt for my friend. She absolutely loved it ... to death. Silk is light-weight, soft and fluid. A silk quilt gives just the right amount of warmth for an afternoon nap no matter the season. I've made a new one to replace the tattered one that she's gallantly been trying to keep mended. 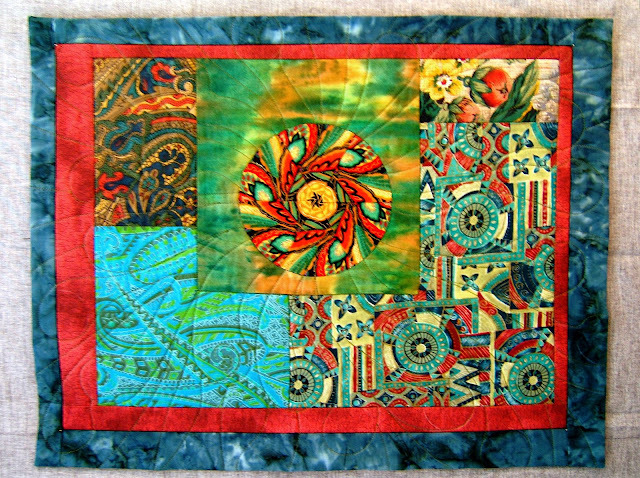 The center panel is an Anne Kline silk scarf that has special meaning for my friend. The brightly colored silk print expands the center and sets off the lion on point. The muted green calms the "shouting" orange and pink. 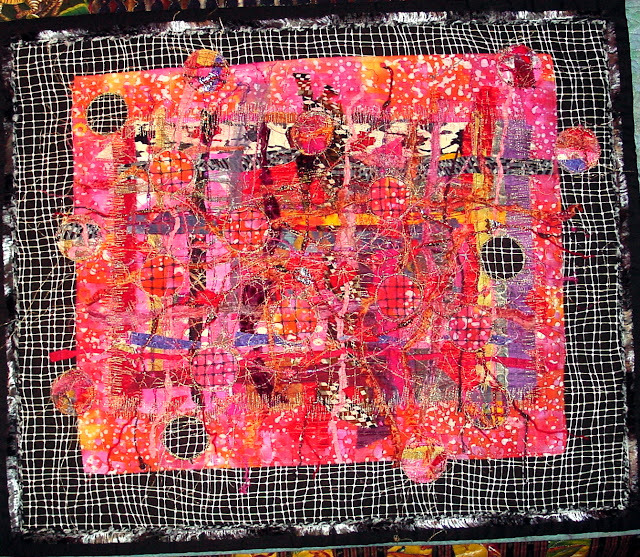 Her old silk quilt was hand-quilted. This one is done by machine. I was inspired by Ferrets marvelous work. Her patterning is dense, whereas I kept my variations on the spiral open to maintain a soft drape to the quilt. To help keep that quality I used Thermore ultra thin batting. The backing is made from one of my friend's favorite dresses. She had passed it onto me, but it was more "her" than "me" so it had just hung in my closet for the last year or so. It was a wonderful batik printed rayon that had long sleeves which produced four squares in the center. The double layered bodice had enough material to make the rest of the back. The muted hues on this side is a nice foil for the bright orange and pink silks on the other. A soft light brown cotton print for the binding bridges the two sides. Sssshhhh! if you know my friend, Alicia. I like to make "stuff" as well as create art. Especially presents for my family and friends. 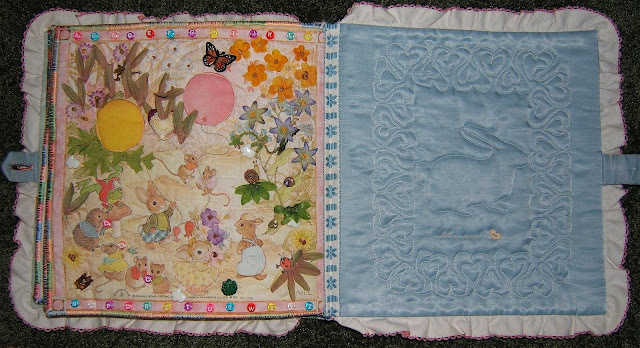 One of my favorite gifts is this fabric book I constructed for my granddaughter five years ago. The basis was a preprinted fabric panel. 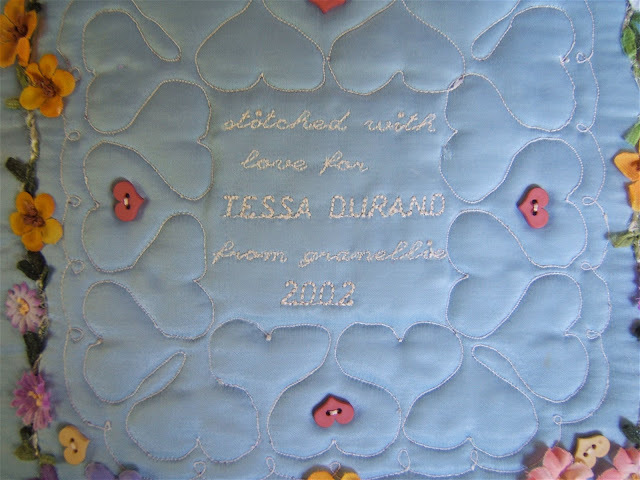 It was more fun embellishing it with findings and embroidery for Tessa. The cover has silk ribbon embroidery and silk flowers attached to printed flowers with colonial knot centers. Of course, there had to be a photo of the two of us. She was a bunny for that Halloween wearing a custom her mother had made. 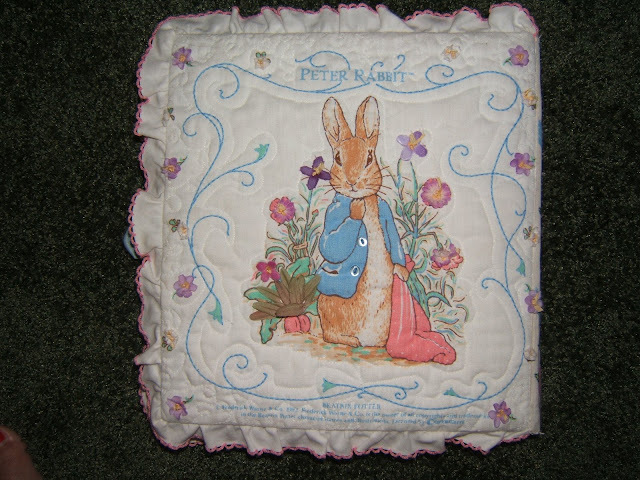 The flannel Peter Rabbit fabric was left over from baby items I had sewn for her brother and twin cousins. 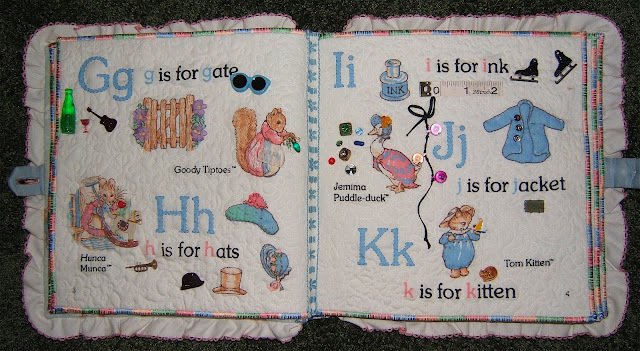 The opening page is machine embroidered and quilted with silk ribbon embroidery. 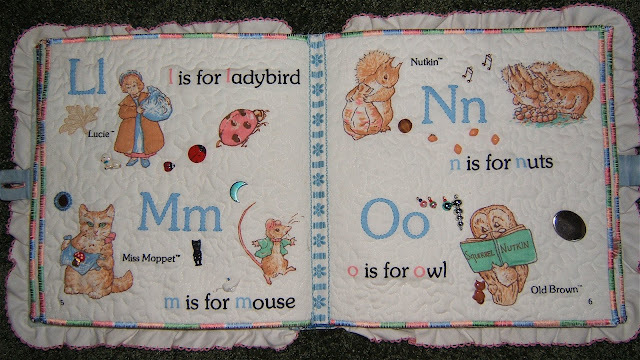 I especially like the cameo, Elvis, the footprint, and piece of fabric. 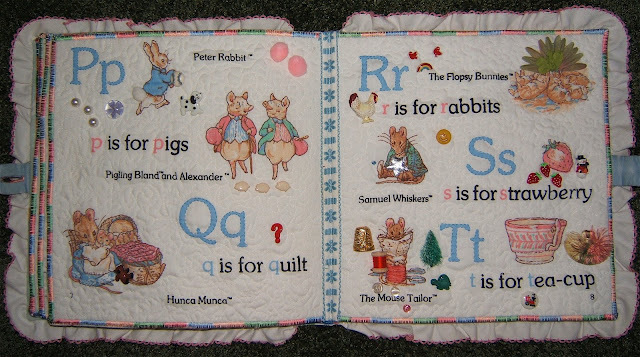 The letters and figures are hand quilted with machine stippling in the open spaces. The green bottle and glass along with the ice skates, the "jewels" and a real piece of jade are my favorites here. I'm fond of the antique piece of lace from Tessa's great-great grandmother's linens, the (shisha) mirror, monster, and the ornaments on these pages. Pearls and the paper weight, plus the pink pompoms tickle me. I don't recall where I found half of a thimble. And then there's the silk tassel and smiley face. The USA Olympic pin was a lucky find. The copper wire name pin had belonged to my mother. The foxes tail is made of mink from a collar belonging to my husband's mother. I devised a yo yo from two buttons and a piece of string. The bees wings are tulle netting that flap. 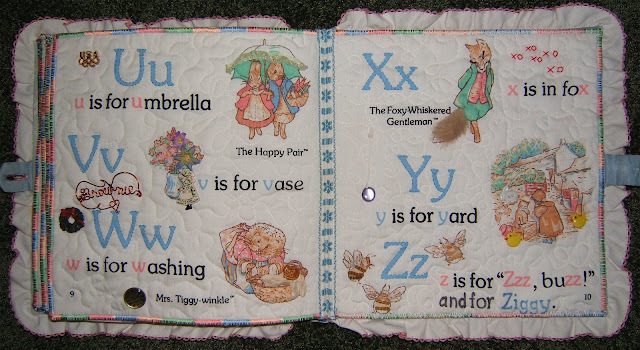 The last page is a handkerchief I had purchased back in the 1980's when Tessa's father was a teenager in hopes that I would someday have a girl grandchild. I added many little treasures. Most of them hiding among the silk leaves and flowers. 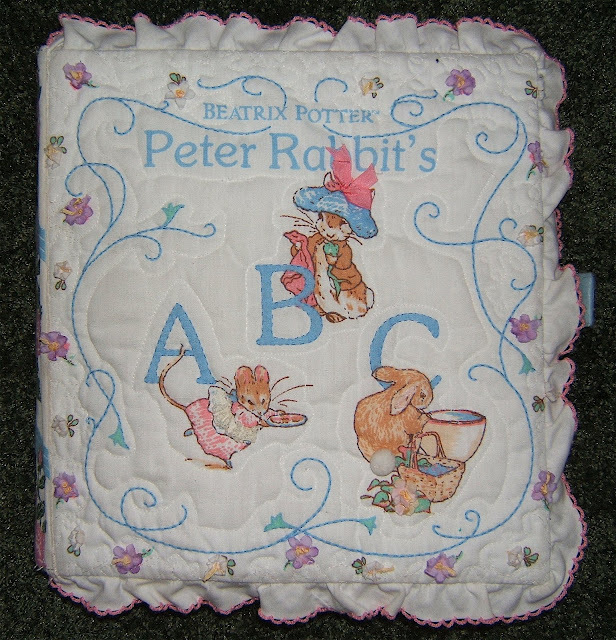 The inside back cover is machine quilted and embroidered. It buttons closed with the only Beatrix Potter button I had. Tessa still enjoys her book and has taken exceptionally good care of it. These photos were taken last summer and the fabric is as clean as when I presented it to her. There has been a bit of mending over the years. She talks about reading it with her children. I do believe this is an heirloom for at least another generation beyond her. One of my favorite artists, Paula McCullough, is featured here. I cannot recall how I discovered Paula and her art. 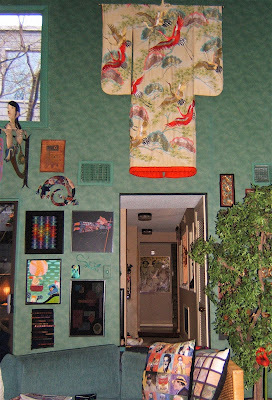 I do remember I was so blown away by her creations that I had to have one hanging on our wall. Her art is a pleasure to behold and to hold. I can almost feel her energy when I touch as well as view "Harmony". I love the added dimension of the shadows cast by the sculptural form of her wall pieces. There’s something different about the art depending on the time of day or lighting conditions. Many of her pieces cast much more shadow than this one. 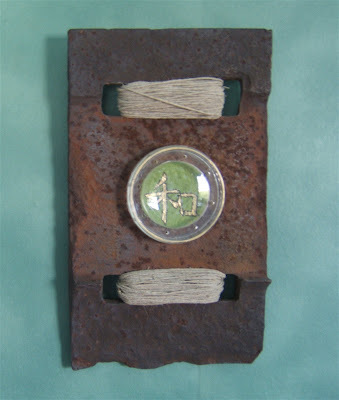 It was Paula’s 100 clock series made with railroad plates along with a developing cyber friendship that pushed me into creating the series of my own 100 lake quilts. My older son purchased two of her clocks ... one for himself, the other as a house present for his friend who's a railroad buff. We both can attest to receiving well packaged art pieces in good time, as well as being most pleased with the art and her craftsmanship. I keep up with Paula's weblog, "self taught artist", so I don't miss seeing and reading about the process of her marvelous creations ... as well as her struggles and triumphs. 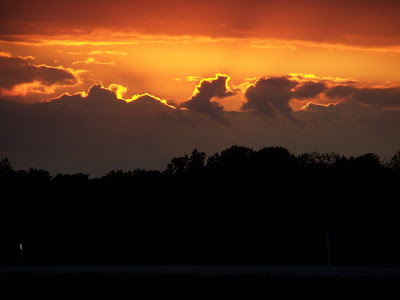 A year ago last August, a niece had taken this photo somewhere between Indianapolis and Bluffton. 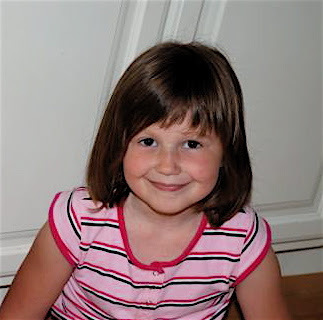 It was a special day for my sister when all six of her children "came home" with all of their children. 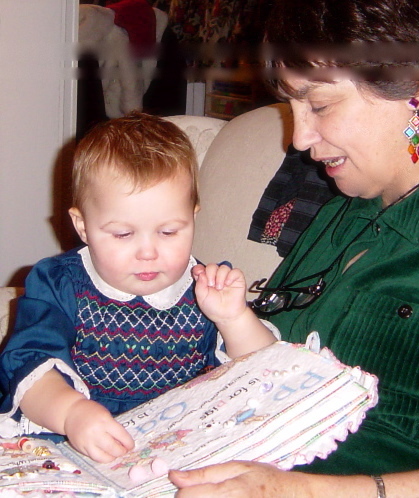 It was a memorable time and just before her radical surgery. It's also the last time that she felt like "herself". 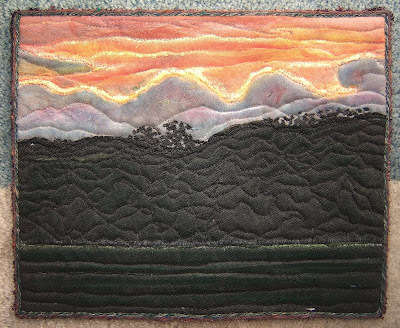 I've interpreted this sunset that embodies so much meaning into a small quilt as a birthday present for her (which is later this month). "Indiana Sunset" - 13"x 11"
It ended up with quite a bit of pastel work to help light up the sky and to define the foreground. I also lightly swept the flat side a green pastel stick across the quilted black trees just give a hint of color that can be seen at that time of day. While working on this piece it occurred to me how comfortable I feel working in this scale (13"x 11") for large landscapes. This collage has no orts. It felt strange to rummage through stacks of fabric instead of digging in a big bag. PS: sshh! if you know my sister. She doesn't have a computer or access to one so I feel safe that sharing this won't ruin the surprise. Now that it's December I'm getting in the mood for the holidays. Go here to see me do a happy dance to welcome the season. While you're there set up a session for yourself or even your loved ones. Enjoy and have fun! One of my traditions is making a big nest of chocolate mice. Their bodies are maraschino cherries double-dipped in chocolate. They have heads made of Hershey kisses. Slivered almonds make great ears. Drops of black gel frosting create their eyes. 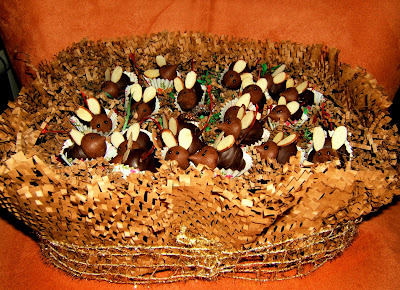 They're almost too cute to eat .... but, YUM! PS: I had posted about making the mice a year ago here. There's a bit more information about the ingredients in that one. PPS: If you cannot find stemmed cherries, pipe cleaners make cute and colorful tails. I recommend the chenille craft pipe cleaners be cut in half and cork screwed around a pencil. Then insert them into the cherry before dipping, so you have a handle for the process. The stiffened chocolate will help to cement them in place. I've received a PIF art gift from Shirley Goodwin in New Zealand. 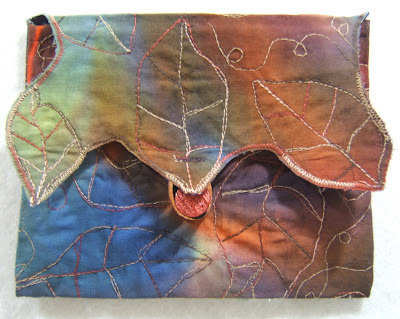 This beautiful bag created with her hand-dyed fabric and quilted with a leaf pattern measures 9"x 7". I looooove it! It was a big surprise to get a package from my first PIF recipient, Amy Munson. I guess this would be called a PIB (Pay It Back) gift. 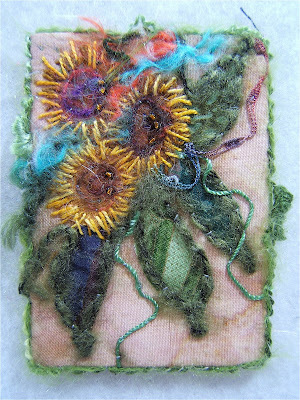 This lovely card of felted and embroidered flowers is 2 1/2"x 3 1/2". It is one of several she's recently made and posted about on her blog. 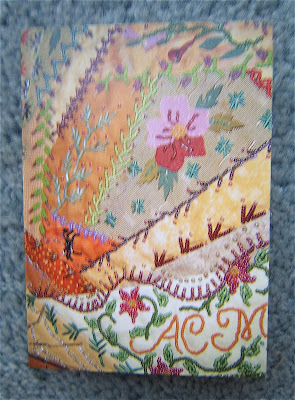 The notecard that accompanied it features a picture of a portion of a wonderful crazy quilt with lots of beading made by Amy. 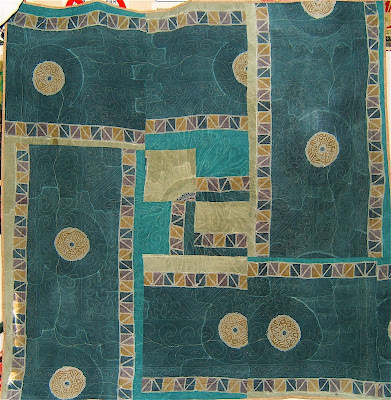 That quilt was awarded 1st place in the Capital Quiltfest Show in Bismark, North Dakota. Go here to enjoy a presentation of close-up photos. This one of the card doesn't do it justice. I'm soooooo pleased to receive these creative gifts of art. Thank you Shirley and Amy. 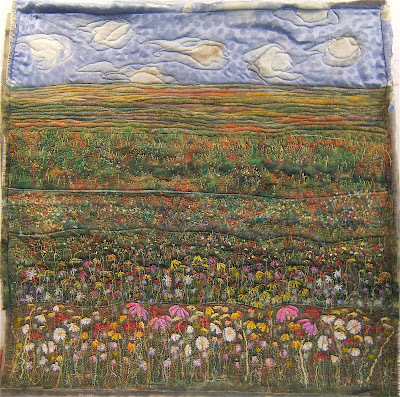 This one began as the first prairie flower study. I had gone online to research photos and information. The foreground flowers were constructed with bits and pieces based on my findings. I kept them loose and impressionistic, but still recognizable. At this point I was most excited and pleased about this project. I added more bits and pieces for the impression of flowers in the background along with some wool roving plus bits of yarn and thread. 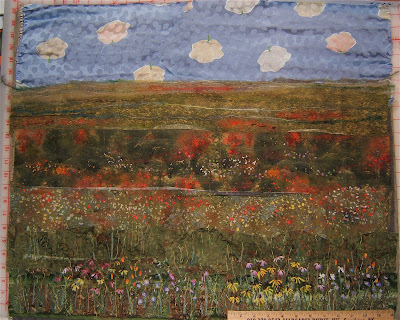 After layering on the tulle I quilted the foreground flowers. To my dismay they lost their "punch". 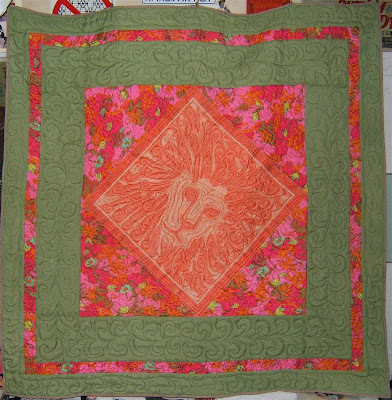 So I made an additional strip of larger flowers and machine quilted it. 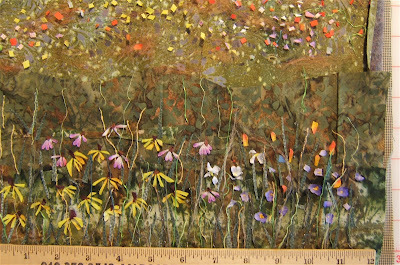 Then I positioned the new strip of flowers over the bottom of the quilt and made a wavy cut through both layers. 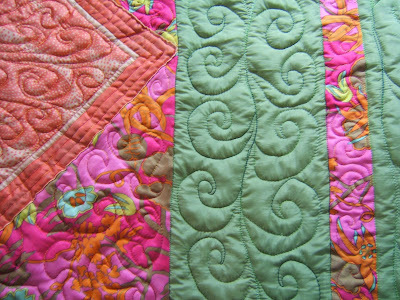 The edges of the strip and quilt were butted together and connected with two rows of zig-zag stitching. 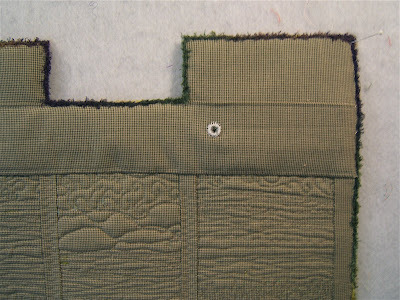 Additional quilting lines of grasses secured the seam. At this point, it had become a lot of work and I wasn't feeling too happy with it. That's when I decided to make a small study in the style of my lake pieces. Now, that was FUN and I very much liked the result. So, I made another one. Both are featured here. Back to work on the larger study. I finished the machine quilting. It looked static and I was thinking about starting over. However, there was a deadline. These studies had to be in the mail for a client presentation and there was no time to begin anew. Just before I fell asleep that night, it occurred to me to cut it up and rearrange the pieces. The next morning I printed several copies of the above picture. Each was cut into 5 vertical strips. I played with varying arrangements and settled on this one. 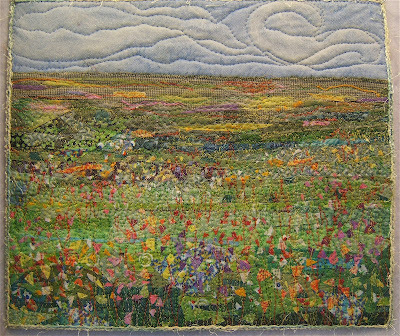 Prairies Flowers I - 28"x 29"
Yeah, it worked! Fracturing the picture improved the dynamics greatly. I'm pleased with the flow of the foreground flowers ... they seem to be swaying in a gentle breeze. 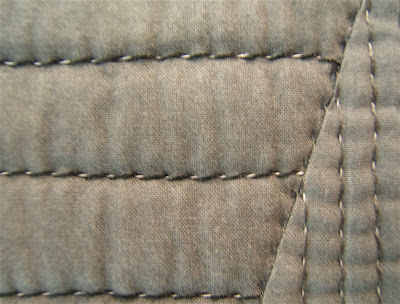 A wide zig-zag stitch holds the panels together. A hand-dyed flat rayon yarn is couched over the seam. On the back the seams and outside edges are concealed and at the same time secured with flat tubes of fabric. The shaped top and bottom have interfacing and are lined with the backing fabric. A flat metal bar was cut to size and sewn into the sleeve. I adhered Duck tape to the cut ends so as not to damage the quilt. Before attaching the sleeve I marked the appropriate corresponding holes for hanging. A buttonhole stitch attaches a metal ring around the hole cut in the fabric sleeve. My solution to the problems in this piece has led to the proposed configuration of a very large wall piece. I could construct it in banner style pieces of up to 12 inches wide. Whereas, a one-piece construction style would limit what I can physically handle. 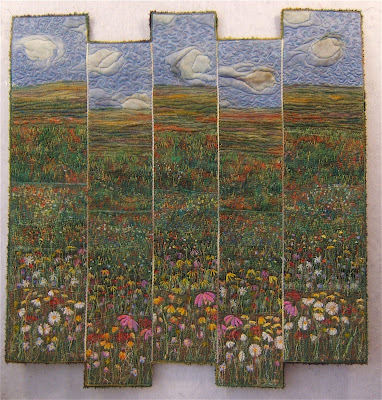 A large piece could even have each panel finished separately and hung individually side-by-side. Then there would actually be a slight swaying movement to the flowers ... and grasses ... and clouds. WOO HOO!!! The clients were pleased and there will be a commission. They even purchased the three studies. 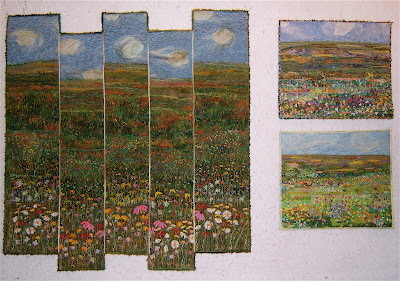 Instead of lake pieces here are two of prairie flowers constructed in the same "ortwork" technique. Summer Prairie Flowers - 13"x 11"
Spring Prairie Flowers - 13"x 11"
These are two of three studies I have made in preparation for a possible commission project. Between getting settled back here in Tennessee and working on this project there's been no time to add to my 100 Lake series. Number 51 was the last. I most likely won't have the time or space to create more until after the new year. 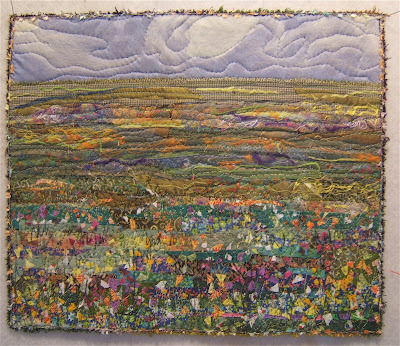 More is to come about this prairie flower project. 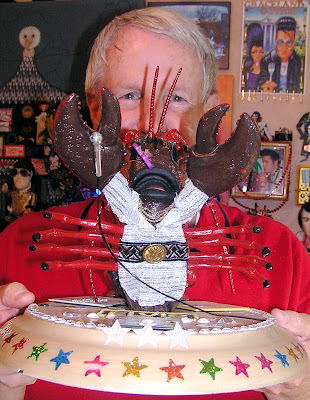 Wishing you a happy day from my "turkey" with his singing Elvis lobster. 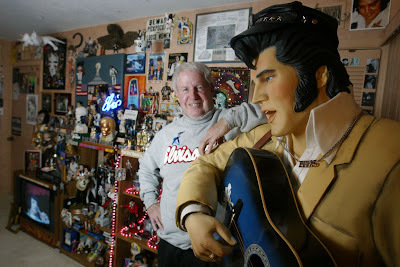 He's already visited Graceland to shop for more stuff(ing) for the Elvis Shrine Room. I am thankful to have this Elvis fan and his quirky sense of humor in my life. The values we use in our art is the language of emotions that triggers reactions. We each naturally respond to various combinations whether we're viewing OR choosing them for our work. Most of us create with what "feels right". That is the heart of individuality. Just as our verbal language is full of nuances depending upon the tone of our voice and words we choose, such is the combinations of values, hues, and patterns that we put together in our art. Kay had left this comment/question on my post, "Value vs Color". "This is a fascinating post. I've never heard the ideas about the mood created by different values before. I also have a light value quilt on my bedroom wall (with less contrast than yours) and I agree about the mood effect. I find it peaceful early in the morning. The only one of these I question is the last contrast, medium value (low contrast). 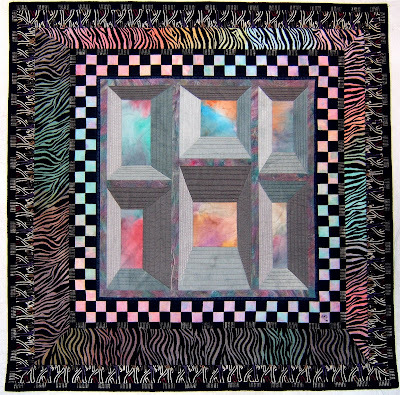 Surreal and mystery fits your piece, but aren't the fabrics partly responsible for that? Would all colors create the same effect, do you think? " She has a good point. I realize this particular piece for that study is on the edge of acceptance for the given description. My choice of fabric patterns does play a role in the surreal mood of the piece. 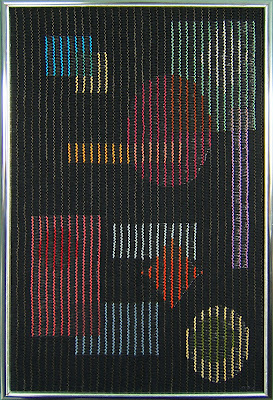 It was the last one I had done of the six pieces because working in a limited middle value range of colors is not easy ... and by then I was DONE. Now that I've shared this theory and those pieces, I guess I'd better address that category more thoroughly. 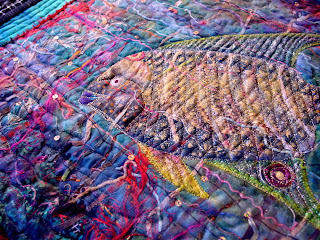 I had to do quite a bit of pastel work on the fish to make it stand out from the background. There's a warm/cool contrast between the colors/hues but very little contrast between their values. 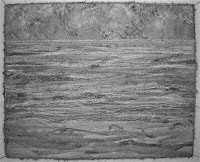 The second listing for a weak contrast of medium/middle values extends the contrast to some degree in the direction of black and white. It is this extension of the range of values that suggests a feeling of fantasy, mystery, or surrealism. This is the one I had employed in the study. Many pieces that I make with this weak contrast of middle values get lights and darks thrown into the mix. 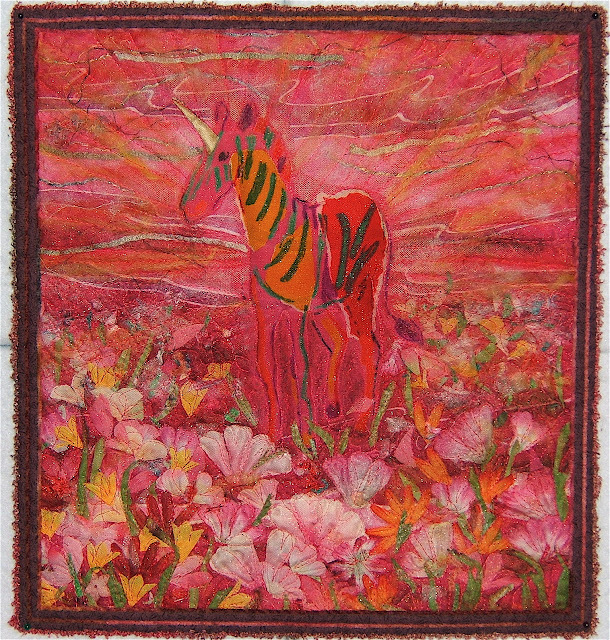 "Land of the Unicorn" - 12"x12"
Kay's latest project is about Ghost orchids. I consider that her main choices of middle value hues extended with the addition of dark gray and lights work to give it a ghostly, surrealistic mood. Now, she didn't consciously select these values to get that feeling. However, her innate sense of the effect she desired for this rare and unusual flower led her to choose them. Many times trouble with a color combination is a value problem. Theories and principles are good to know when there is a problem in getting the results we're after. This knowledge gives us a direction to look for a solution. Making the rounds of quite a few blogs is the question,"what's on your bed?" The usual response is a photo of a beautiful quilt on a bed. Not mine ... there's a down comforter in a plain duvet cover on my bed, BUT each morning I awaken to this quilt hanging on the wall across the room. 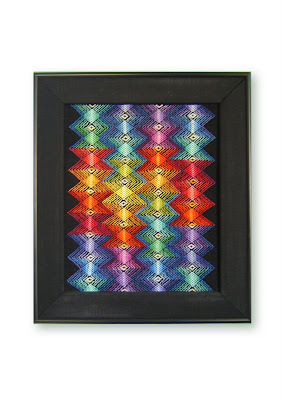 This piece is made from plain and commercially printed fabrics that I hand painted. There is both hand and machine quilting. 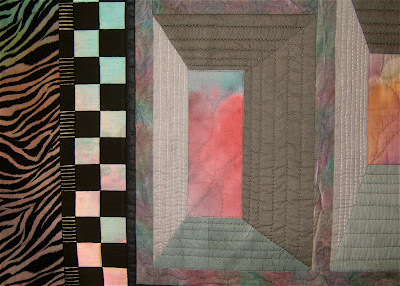 I whip stitched a silk thread around the quilting stitches within the window frames to accentuate those lines. 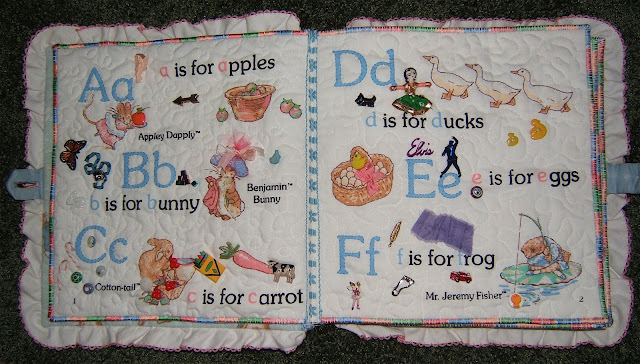 PS: There is a quilt on my bed at the cottage in the "land of OZ". Go here to view and read about it.